Pentax has announced the 'Q' mirrorless interchangeable lens camera. The camera is the first to use the company's Q mount and features a compact-camera-sized 1/2.3" image stabilized CMOS sensor. This is wrapped in a magnesium alloy body with a distinctly rangefinder-esque design but distinctly compact sizing. Its feature set ranges from the 1080p30 movie shooting (with H.264 compression), to a series of fun filters that can be applied to the Quick Dial on its front plate. We've had a chance to play with a pre-production Pentax Q and have prepared a quick preview. 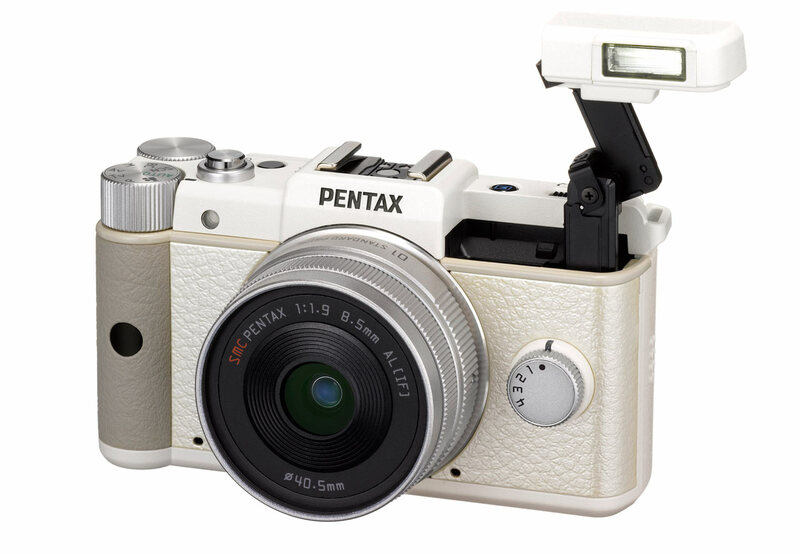 GOLDEN, CO. (June 23, 2011)…PENTAX Imaging Company has announced the PENTAX Q – the world’s smallest and lightest interchangeable lens camera (ILC). * The Q offers the versatility and precision of an advanced DSLR in a body that is significantly smaller than every other digital ILC body available on the market today. The camera’s tiny size, lightweight design, and superior image quality are made possible by an innovative PENTAX developed imaging system. With a high-resolution 12.4 megapixel, 1/2.3 inch CMOS image sensor, the Q carves out an entirely new camera category that extends beyond traditional digital compact, APS-C or 4/3 digital cameras. The backlit sensor is a highly efficient light-gathering instrument that produces very little noise at high sensitivity levels particularly in low light settings. Further, the new Q lens mount is a perfect match with the new sensor and every interchangeable Q lens is designed for more advanced image quality than may be found on traditional compact digital cameras. This innovative PENTAX design is the foundation of the Q’s position as the world’s smallest, lightest ILC system with superior image quality. A newly designed PENTAX Q-mount lens system for convenient interchangeability with a variety of specialty Q lenses including prime, zoom, fisheye and more. Exceptional image quality in 12.4 megapixels from the Q’s 1/2.3 inch backlit CMOS image sensor. Capable of producing 12 bit DNG RAW and JPG images, the backlit CMOS sensor is a highly efficient light-gathering instrument designed specifically to produce very low noise at high levels of sensitivity. Extremely compact, durable, lightweight, scratch resistant magnesium alloy body. A variety of creative modes, Smart Effect options, or camera settings that assign to the Q’s Quick Dial located on the front of the camera. Smart Effects modes enhance digital photography by applying a series of effects to images to achieve high quality finishing. Brilliant Color, Vintage Color, Warm Fade, Bold Monochrome, and Water Color are just some of the Smart Effects available and may be assigned on the Q’s Quick Dial. In-camera HDR capture mode shoots 3 images of varying exposures, blending them to bring out the details in even the darkest shadows and brightest highlights of extreme contrast shots. High quality motion video with stunning full 1080p HD clarity at 30 frames per second. The Q processes the full HD video using high quality h.264 compression for superior color and detail and offers creative video effects through custom image modes, digital video filters, and interval shooting. A sensor-shift Shake Reduction system with integrated DRII Dust Reduction for blur and dust free images even in low lighting. 5 frames per second continuous shooting mode for any fast action setting. Effortless bokeh control with the Q’s Bokeh Control filter. (Traditionally controlled through a DSLR lens’s aperture, bokeh is the out of focus part of the background that helps to emphasize the subject, drawing the viewer’s eyes to the most important part of the photo.) The Q offers a fine degree of extra control over image bokeh via an in-camera filter operation. Powerful USER modes allow the creative photographer to save a series of favorite camera settings, filters, and custom image modes for instant reuse. Shutter speeds range from 1/2000 to 30 seconds for freezing fast action or capturing long nighttime exposures. Bulb mode adds flexibility for low light photography and motion effects. A built-in popup flash adds the perfect amount of extra light to an image with a high extension to naturally reduce the redeye effect common to compact cameras. The Q’s flash is effective to 23 feet at 200 ISO, and covers a wide angle 28 degree field of view. Compatibility with the latest generation SD, SDHC, and SDXC memory cards for ultra-high capacity storage as well as outstanding image file portability. Along with the Q, PENTAX introduced the PENTAX 01 Standard Prime kit lens and an optional optical viewfinder. The unifocal standard lens has a focal length equivalent to 47mm in the 35mm format. The lens offers a natural perspective similar to that of the human eye and is ideal as a multipurpose, everyday standard lens for various subjects including landscape and portraiture. With a maximum aperture of F1.9, it performs superbly in dim lighting and may be easily adjusted for bokeh. Incorporating two high grade aspherical optical elements, this lens compensates various aberrations to a minimum . Featuring the state-of-the-art optics incorporating special optical glass elements and PENTAX exclusive lens coating technology, this lens delivers beautifully defined, high quality images that are sharp and high contrast even at the edges. The AF motor installed in the lens assures smooth, quiet focusing operation. The lens shutter mechanism allows the PENTAX Q’s built-in auto flash to be synchronized to the camera’s top shutter speed of 1/2000 second (or 1/250 second when using an accessory flash unit). This lens is also equipped with a built-in ND (neutral density) filter, which comes in handy when shooting with open aperture at bright locations or when using slower shutter speeds. Available in white or black body models, the PENTAX Q and Standard Prime lens (available in silver) kit will be around $800. Initially, the PENTAX Q system will ship in Japan. Anticipated shipping time to the United States is early Fall 2011. * The world’s smallest and lightest digital interchangeable lens system camera, as of June 15, 2011 (based on PENTAX research). Now I remember why I haven't been back here in years - and am never coming back. So long, negative folk. It is also value for money and easy to handle during travel. It is awesome. Very handy, i can carry it whereever i go without any hassle. I don't know why anybody would call it "rangefinder-esque". Typical rangefinder cameras combine the rangefinder with a good sized bright line optical viewfinder and this thing has neither. Though it may be meant to evoke the old Pentax Auto 110 slr , that camera had a rather larger format and an optical TTL viewfinder which was small but useable. With such a tiny sensor they could easily have made it an slr: or perhaps a fixed mirror design with an EVF. Unless the sensor performance is a quantum leap forward from all other compacts ever made, it is likely to become the henpecked runt of the mirrorless litter, with everybody going on about low sensor performance. Hm, looks like a digital Diana. Only the Diana would never cost 800USD! Seriously, what’s the point of this camera? You don’t need interchangeable lenses for compact cameras! There are retractible lenses, collapsible lenses, that are small, good, and don’t cost an eye, because they are already included in the camera! Why would I buy this over, let’s say, a Panasonic LX? Mad, Bonkers, Completely Off Their Trollies, no wonder Hoya dumped Pentax, if this is the kind of nonsense direction they are headded. This is the same size sensor that Canon used in their Pro1 over 7 years ago, albeit a 5mp sensor, rather than Pentax's 12mp. Canon put a really great 7x "L" series lens in front of that sensor and it was a FAB camera. But the IQ was not FAB and neither will the IQ be FAB from this Pentax. It cant be anything other than mediocre and very very noisy. Ok Form a que here for a really mediocre $800+ toy interchangable lens camera, that only a small boy, with small hands can hold, oh and it still wont go in your pocket. Or form a que over here for what is possibly the best DSLR in recent history, bar none, for just $1200. Any guesses where the que is going to be? Pentax delivers a new class of camera. It has almost all of DSLR handling features at the size of a pocket camera. To me this is a winning concept. I already have a very small APSC DSLR (Pentax with Pancake lens). I am looking for a camera that is significantly smaller, yet handles like my DSLR. To me it seems only the Pentax Q fits the bill. And with significantly smaller I mean camera __and__ lens. This is why e.g. a Sony Nex does not fit the bill. The camera is small, but the lens is not. So if I can get the small camera with DSLR features only in case I sacrifice sensor size, so be it. You only can take pictures with a camera you have with you. A Sony Nex or Olympus Pen I would never carry with me at all times. A Pentax Q I might. I now carry with me a Fuji F 50. I am happy enough with the image quality, but when using creative control handling is too slow. I am expecting that the handling of the Q is excellent and fast. I am waiting for this camera since years. I sound like you need a Fuji X100, The lens camera combo is narrower than Olympus Pen plus Lens and has a beautifull APS-C sensor. Thank you for the suggestion. I indeed looked at the Fuji X100 in great detail. It is a beautiful crafted camera, I do not mind the fixed lens, the great IQ is a bonus. On paper it has exactly the Camera gestalt I am looking for. But if you read photographers reports on using this camera in real life, the X100 falls really short very badly behind its potential. It has many quirks that would prohibit me to take the shot. I am considering to buy the Pentax Q to have a camera to take the pictures in casual situations. I do not care the image quality so much. Right now I am using the Fuji F50, which has the same sensor size as the Pentax Q. I am happy with the IQ. I do not need better. But I am really not happy with the Gestalt. Say I want to switch between Aperture priority to Shutter priority. By the time I am there my shot is lost. Say I want to change the shutter speed. By the time I did the shot is lost. IQ is not everything in every case. In my case handling is way more important. I really think you should check out the NEX cameras anyway. Yes the lenses are not much smaller than DSLR lenses. That's physics. You have a lens designed to operate over a certain range of focal lengths & max apertures for a given image circle, you are pretty limited on its size. But the NEX bodies are significantly smaller than DSLR bodies. Even the smallest ones. If you want something small enough to carry around just get one of those Canon G12s or w/e. This thing does not warrant being bought over a good enough fixed lens point and shoot or larger sensor mirrorless camera. Thank you sportyaccordy for your reply. Isn't it interesting how we differ in the approach? You are looking for the smallest body that has a large sensor and accept that the lenses fall where they may. I am looking for the smallest camera (incl. lens) that has all creative adjustment dials and for me the quality can fall where it may. To me the small sensor size is perfectly OK. But e.g. the NEX camera would not be OK for me, because it does not have all the create control dials, that the Q has (or any DSLR for that matter). I want to get the shot I see in my mind. That means I can adjust shutter speed, bokeh, focus, ISO setting just using mechanical controls without looking at a Display. If I would need to look at the display, I would leave the "zone". I would loose the moment. To be able to control the camera without looking at it is most important to me to get the shot. That the camera is as small as the Q is important too, so that I have a camera with me when the shot happen. I am not saying that the Q is a great camera for everybody or that it even will work for me. I would only know that after I use it for some time. Can I hold it in my hand comfortably. Can I indeed change all settings w/o looking at the camera. Basically, is it possible that the camera disappears in my mind and all I see is the picture I want to take. If that will happen, then the camera is for me. All I am trying to do here is to offer a different perspective to think about: That for some shooting purposes, like family pictures, the following things could be more important than IQ: How fast can you change the settings, can you do it intuitively without loosing the concentration on what you want to photograph, is it comfortable to hold the camera for a long time, is it small enough to be with you at all times. Is its appearance not intimidating to not scare the people you want to take a picture off. Is it small enough to not cover your whole face, so you still can smile at your kid ? Hi Hubert, hope you stick to your convictions on this one. I believe you're right - there is so much more than to amateur photo taking than image quality. Being able to grab the photo you want, with the creative elements presented how you want them. Pentax could learn a thing or two from Olympus. Olympus is in different problems: they must produce m4/3 cameras to establish themselves on the market, because they have dumped their DSLR line. 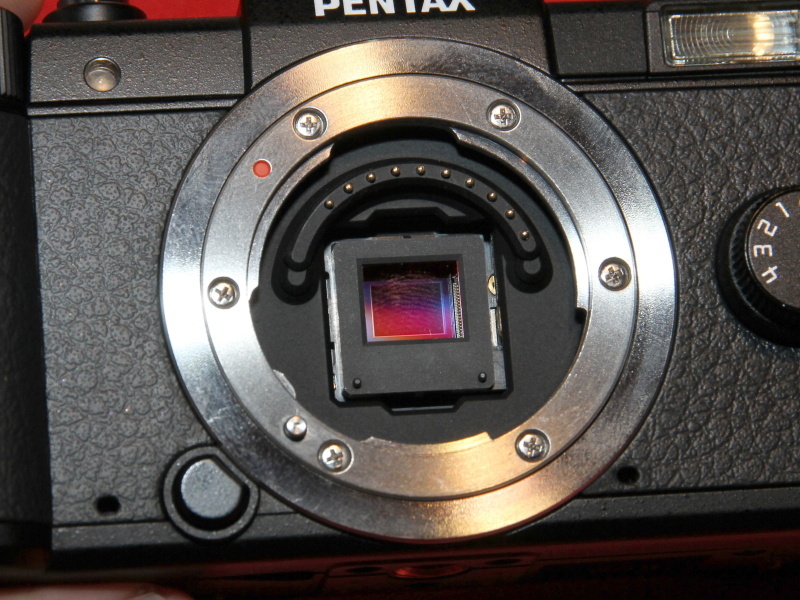 Pentax has TWO extra lines beside Q, and that K which can work with APS-C and FF, and also 645. So, Pentax DOES NOT sacrifice anything re pure image quality (both K-5 and 645D are stellar!) but they wanted to explore the avenue of maximum performance in a small size. To do that, one MUST use small sensor. So this is a creative addition to an already great range of superb image producing cameras, and many people on DPreview don't get that. Olympus does not enjoy that freedom of creativity. Zvonimir, I will I could hit the "LIKE" button 5 times for your post. The Q looks great, and now that I've seen the excellent IQ, I totally want one, possibly to replace my Ricoh GRD III. It's kinda cute, except for the pop up flash that looks like a miniature "War of the Worlds" knock off. I can't understand the market though. People who want good quality IQ seems to me, would stick with a camera like the G series or LX with a single fixed lens they don't have to monkey with, and the cleaning. People who wan't better IQ that larger sensors may provide, would go for APS-C or M4/3, and the size penalty isn't much comparatively. It's disappointing to me, I'd thought Pentax would come in with a small APS-C (able to use existing lenses) or M4/3, which would have given lens junkies a boost. Man it sure isn't cheap. I agree with you that IQ will not be great. From my experience with this sensor size (Fuji F50) it will be sufficient for documentary or family shots. What if the key attraction of this camera is not IQ, but handling. What if the target customer is a DSLR user, who wishes to have a camera that handles exactly like his DSLR, but which is significantly smaller. If one comes from a Canon 1Ds I am sure the Olympus Pen camera will look much smaller. But if one comes from a Pentax DSLR with a 40 mm Pancake lens, the Olympus Pen is not that much smaller. To me the size different was not significant enough to buy it and use it when my Pentax DSLR is too big. The Canon G series was same problem, too big. The Panasonic LX handles more like my Fuji F50, which I am not happy with the handling. By the time I am done to make a creative adjustment, the shot is lost. To me the Q is a camera to fast adjust creative setting and get the shot. It may be the smallest camera with fast creative control. Dear sera666, thanks for your experience report on the X100. I saw that there was a new firmware release, but some photographers were still not happy with it. I do not doubt the extraordinary image quality. I own many fujinon lenses. How is focus confirmation with manual focusing? Is it useful? I maybe shall wait for another firmware update and then borrow this camera to get a feeling for it :-). I certainly like the design and it is great that the lens is very flat. I would need to see how the weight feels if the camera is if carried around the whole day. I live in the tropics. Now is 33C with 75% RTH. I usually wear bahamas shorts with really large pockets. Would the X100 fit in it? Wearing a belt and a pouch would be harder and would look funny with shorts. Sure, admire Pentax for daring to launch an interchangeable lens camera with a 1/2.3" sensor. A cute concept, truely. But pay $800 just to get the body and a prime lens? For the same sum, one could buy both a 1/1.8" sensor wide-angle compact and an 800mm equivalent 1/2.3" sensor zoom model, both with controls galore. Or you could get a D3100 and two lenses. I don't believe 5% of people who say they "like" the Q will actually buy one--at that price. For the Price i'd be prepared to buy ( if one existed) a Canon/Nikon camera with an APS-C sensor with a fixed lens with say a 24-70 f2.8-f4 IS/VR range. but of course this camera doesn't exist and Pentax have missed a trick. And that package would be 2.5x the size of the Q with a lens. Some people just don't get what Q is all about: it is to be a camera to be with you when your APS-C system isn't and can't be, and that's the difference between the photograph taken and photograph totally missed out. I love pentax and Love the fact they Produce great Lenses at affordable prices. iI can see the thought process behind this but its just so poorly implemented. Firstly its not going to have high Noise Level, also the Depth of Field is going to be very limited, and the biggest concern i have is that how on earth is anyone going to clean the senso? its to small. But the greatest disappointment is the price in a global recession its just to costly. Insane concept, the small sensor size is not the thing people are after when they have bought m34 cameras! I have GF-1 but I would rather have a FF camera on that size, if it existed! It's a shame this camera's sensor has a pixel density of over 650 pixels/mm. At $800.00, it surely has the highest pixel density of any camera in its cost range. That kind of pixel density normally accompanies cheap cameras. What's wrong with a pixel density of 650 pixels/mm? This means users will have to shoot at f-Numbers no larger than f/3.2 if they want to prevent diffraction from inhibiting a desired print resolution of 5 lp/mm in an unresampled 360 dpi print having dimensions of 8.33 x 11.11 inches. Why buy a 12MP camera with a sensor so small you can't enjoy the resolution it affords without shooting wide open all the time to avoid diffraction? Of course, we could pretend that diffraction doesn't exist, and shoot with any aperture available on the lens. Or we could make tiny prints. Or we could just throw up our hands and say we really don't care if fine details are degraded by diffraction. Surely Pentax is hoping this camera's market is ignorant of diffraction. Maybe this camera fits into the hands of DSLR photographers who look for a significantly smaller camera than their DSLR, but which has the same handling as a DSLR, with all creative adjustments to be accessible by their dedicated buttons and dials. And with all dials to be easily accessible with a high quality of feeling. The Canon S95 would not have all the DSLR style dials. And a 4/3 camera is not significantly smaller than a Pentax DSLR with a 40 mm pancake lens. Actually to me the "awkward looking body" is what is attracting me the most. It seems like the only possible design to offer so many dials and buttons in a way that they are easy accessible with large hands on a really tiny body. If this camera could keep me "In the Zone" while shooting, it would be different then any model in your list, except a 4/3 Pen camera with viewfinder (which then is about same size as my Pentax DSLR). "As much as I'd love to be enthusiastic about another entrant to the "high-end compact/mirrorless" market, I fear that this camera is all but dead on arrival. I cannot for the life of me figure-out where on Earth this camera fits-in." Same thing Steve Balmer said about the iPad. And then about the iPod too. ...purely because I'm waiting for a Pentax " DA* 11..16/2,8 " to finally being released and because their dslr - lens prices need to adjust to more realistic values (in Germany that is). I'm still in my early stages and to experiment with lenses in the field... ...first I have to be able to afford those lenses. Hopefully this camera will deliver more of a 'creative tool' than a compact P&S. Pentax must have had lost common sense (not that they ever had it in abundance): who on earth will go for a small-sensor camera the size of its APSC-sensor competition! That said, physically this Olympus E-series copycat doesn't look too bad. I think one reason Pentax had to use such a small sensor is because of their shake reduction. They must have decided it was worth the smaller sensor size to keep the body as compact as possible and to also have the shake reduction feature. As a long time loyal Pentax user, I've been waiting for the Mirrorless APS-C sensor camera. One that will work on the K-mount lenses. A camera that competes with the Nex (Sony) cameras, Fuji X-100 and Leica X-1 which I own and is beautifully designed. As Pentax already has many great miniature Limited lenses, that is the camera they should have created. Who needs another mini sensor camera, their are hundreds already. Pentax made a cute camera, but I'm not convinced this is the right direction for Pentax. APS-C is the way to go. Mounting DA, FA, K, M DSLR lenses on a mirrorless body will never be possible without an adapter because of the flange back distance required by these lenses. Not unless they make the mirrorless body as thick as a DSLR. No one ever said this is then last take on mirrorless by Pentax. Maybe they just want as many systems — of all sizes — as they can do? Sooner or later they'll have to make an APS-C size mirrorless. What if it comes rather sooner that many believed? But even then APS-C system can't compete in overall size with Q — Q will always be smaller. And that's important. I think It's an excellent idea, except for the price and size (can smaller) . If it were ~$200 range, I would definitely get it for everyday camera. maybe, they'll come up with non magnesium body and maybe smaller version later. Why smaller? Many say it's already smaller than most compacts, yet it's also fully manual. How's one supposed to handle a camera that small? With tweezers? Intresting, to many emotions can produce this little mistery. I can only say for sure tha the Pentax Q will be a classic one, for good or bad. To succeed Pentax should put in there HSDPA, WI-FI and Triple-Band GSM. I would prefer a 1/1.6 (or similar) sensor not a 1/2.3'' (1/1.X offers double surface). Still how successful can it be when it costs 800€ when an canon S95 (or larger XZ1, LX5) costs about 400€? I not sure who will invest in such system. Maybe pentax knows better or it does that merely for marketing reasons. It is what it is, and we shall see if it succeeds. Still, I cannot recall much banter on Pentax forums requesting such a camera. I can, however, recall many, many folk yearning for a Pentax full-frame camera. Imagine if all of the research and development for this camera and its lenses had instead been used to develop a Pentax full-frame camera. Now THAT would have created a positive stir!! Much more profit potential for this. Assuming they can move any. Something tells me vendors will not be stocking up too much on these if they can help it. It's a losing proposition for nearly anyone involved. I 100% agree with the higher demand for FX. Especially if it came in a DXish consumer grade body at a consumer grade price. But that's another story. But honestly: a k-5 Mark II with a 2:3-format, 35-diagonal-sensor would indeed make me rethink about stepping up from my K20D. Unfortunately they stopped their come-together with Samsung prematurely (at least as far as I know). Otherwise they might have got hold of such a crucial part, already. I don't think they don't _want_ to offer us a 35mm-Sensor-camera: In truth they just _know_ that buying the already-existent Sony-made part would render the final price of such a beast unattractive to most of their most-enthusiastic customers... ...and their current lenses are basically designed around "digital" (="APS-C"-sized sensor-medium) imaging plane. My guess is that the Pentax Market Strategy is to cover the complete scope of ILC (Interchangeable Lens Camera) without having too many models. Including the Q, ILC sensor sizes have now 5 classes: 1) Medium Format, 2) 35 mm FF, 3) APSC, 4) MFT 5) 1/2.3". Pentax simply chooses to span the all classes but to leave out 2) and 4). If after shipping the Q they keep listening to user feedback and continue commitment to the Q System I believe it will be a very successful product. Time will tell. At this point however I welcome this camera to offer me a choice previously did not exist: Handling like a DSLR at the size of a pocket camera. I will certainly try it. There *was* the MZ-D, from yonks ago - I think it reached a functional level, but the company abandoned it because the sensor was too expensive. Which is a shame, because it was good-looking. Personally I really like the look and concept of this camera and look forward to seeing how it performs. Most of the criticism is based on the size of the sensor – which is the same size as the sensor of my FZ38 which produces good quality images, I don't see any reason why this camera will not. The small sensor gives it the advantage that adding a lens does not destroy the small and light concept which seems to be the floor in the most over compact system cameras. I hope they take advantage of the small sensor to provide some long range lenses that will make the system more versatile. The price seems a bit steep at first bit should come down. It's cute but pointless. It neither offers the convenience and compactness of other 1/2.3" systems, nor the low light and low depth of field capabilities of other interchangeable lens systems. In short, it offers the worst of both worlds. If the price were much lower, I could see the toy lenses capturing a niche market. However, as it stands I think the system will be a giant flop. For all the criticism, this is the kind of thing I would like, but the spec. and lenses do look disappointing. I'm a weight weeny when I travel and although I've taken big cameras travelling it's not ideal to climb, ski, mountaineer or cycle tour with an SLR. It's difficult to justify throwing out pairs of underpants to save a few grams and then shove a Hassleblad in the pack! As it stands, you'd be better off with a Canon S95, with its bigger sensor and more zoom that the zoom lens on the Pentax. 1) Sensor looks too small, a 1/1.x or larger would be more tempting. 2) The lens range. Currently a zoom (28 - 83), a fish-eye, and some fairly low grade others. It took Panasonic and Olympus quite a long time to produce a good range of 4/3 lenses. Quality wide and a long zooms would be a good start, with more primes being a bonus. I look forward to the reviews and seeing some pictures. I won't rule it out yet. Deary me, I don't understand why people are getting so upset about this new camera system. If you don't like it, don't buy it and go elsewhere. An aweful lot of speculation with no substance due to there being no production as yet. Sheesh, so much horror happening in the world these days, and people complain about a camera they're probably never going to use. I used to have a number of SLR's in the days of proper cameras, along with a rangefinder or two. I also had the Pentax 110 SLR, until they stopped making 110 film. Small, grainy film that couldn't be enlarged terribly well, but it did what it was supposed to do in the field it was designed for. Why is everyone surprised? I see this as a digital Minox. Very niche. I wouldn't run out and buy it, but I applaud bringing back lots of knobs with direct access to important functions. Wish more manufacturers would get away from touch screens and menus and bring back the knurly knobs! I applaud their design mainly because it sees no contradiction between compact size & the need for manual controls. There is a large audience for those that want full control in very compact sizes - I can't stand how manufacturers dumb down their more pocketable designs. Thank you Pentax! Totaly agree with you about the lack of knobs on todays digital cameras. So many push buttons, command dials and menu screens. Control is so much easier (for everyday basic, but highly important settings) when a camera has a shutter speed dial, aperture ring and ASA, oops, ISO ring/dial. That's where cameras like the X100 and M9 come in, but they are extraordinarily expensive. A digital version of the Pentax MX or Olympus OM1 or 2, now that would be something worth waiting for. Somehow this collection of features misses badly. How can a company that did well with DSLRs and evolved from *ist D, K10D, K20D, K-7, and K-5 and others assemble such an expensive device that looks professional but is essentially a point-and-shoot camera? My Canon G11 is my carry-around casual alternative to my K-5 and K20D, and Canon has for many of us serious photographers assembled the most easy to use small camera with RAW and essential functions that are readily accessible. Sad. The Canon G11 is not as small or as pocketable as this. Cue hipster invasion of photosharing sites with the release of this cam. And lots of myspace voodoo pics, too. Although Pentax does need to keep up in today's modern market where smaller is supposedly better, I don't agree with this new Q mount, and how Pentax have dubbed it a "toy lens". I've always been fond of Pentax for their traditionalist ways, and not playing to the unwitting, new buyers of DSLR (they've lost me now). Seem's like they've marketed this new Q mount towards people who are new to DSLR's and haven't really researched what a good camera is. This is in stark contrast to a company like Samsung, who are relatively new to producing DSLR's, but have done a brilliant job at their first camera's, where as Pentax have been in the game a relatively long time but have now let themselves down. I think I see a certain pattern here. Camera companies try to make the smallest body for a system camera. It doesn't seem to have a relation with the size of the lens. With such a small sensor, can't they make smaller lenses? It is meaningless for dpreview to call this type of interchangeable lens compacts "mirrorless" . It is really awkard. I agree, I actually suggest DPREVIEW to change the classification of camera in the website, no more compact and interchangeable lenses camera, but just small sensor and large sensor, with small sensor being everything smaller than a 4:3. That would be more fair towards high quality cameras like Fuji x100 and Leica x1 with APSC sensor and would point more attention on quality, rather than quantity of lenses. Would be cool to have a pool on that, who would agree? The thing that doesn't make sense to me is not the launch itself, but its price. It would be funny to play with a kind of a miniaturisation of an SLR or a mirroless system, but the price is totally an absurd and I think that Pentax is betting all its name and some dumbness of some consumers to make it work. Just what I was waiting for. Now I can use a manual focus 100mm macro lens on it with an future adapter and get a super duper telephoto lens ! Love the massive crop factor! LOL....seems like I am the only one actually waiting all this time why aren't camera makers make excellent compact cameras with interchangable lenses? after nearly 10 years of wishing Pentax made it come true. HUrrah. This camera is stylish. And believe it or not: this will be a reason for many people to buy this camera. I could see this being the case if it were maybe 1/4 the price. This would have made more sense as a "styled" fixed-lens PnS. Give it the "feel" of an old camera, hipsters would buy it by the truckload. I didn't like it. I was expecting to buy a new pentax but not this freak. Sensor size is also a disappointment. Why should I buy a new Pentax which I can not use my old pentax DSLR lenses? It is not ergonomic. And sorry but not innovative product. Waste of R&D time and budget. I thought this looked great until I saw the sensor size, what's the point? to dupe compact buyers into thinking they are getting better results? Why would you have interchangeable lenses on a camera with a tiny sensor?? I guess everyone that criticise this new posibility or alternative camera, have tested Pentax Q in all condition, every setting and lenses and had compare it with competition (or more similar ones), so they can say that this is a bad choice and a waist of engineering. I say lets see how this work first and then you can judge it properly. On other hand, a ff Pentax cam are a wish of all of us, but you may not increase your market with equipment only for pros or semi-pros. Instead you allready have 645D as a top 1.